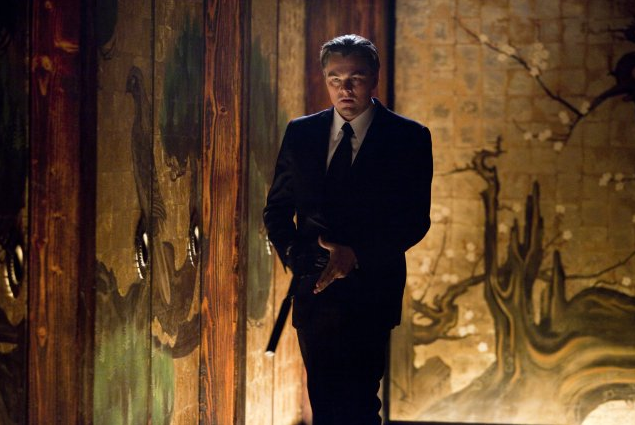 One movie that Inception brings to mind more than any other, though, is Martin Scorsese’s Shutter Island, and not just because of Leonardo DiCaprio. It’s an acclaimed American director, not quite at the top of his game, but playing it nonetheless. Shutter Island was the best movie of the winter because amidst all the crap, it was a movie that could be talked about on both an intelligent and entertaining level. Inception is the same. As far as visuals go, you’d be hard pressed to find a movie this year that’s more striking and engrossing in that sense. It is probably Nolan’s best looking movie to date, even if it’s not his best. You’ll see a city turn on itself, a train plow through the middle of a crowded street, and jaw-dropping physics-bending fights in a hotel. Spoiling the intricacies of this multi-layered dream world that makes up the movie’s core would be to ruin the best part of it. The first 45 minutes are, like many high-concept movies, purely there to explain what exactly is going on. This happens when Cobb (DiCaprio) explains to newbie Ariadne (Ellen Page) how exactly one infiltrates the mind. This first third of the movie is textbook in both its structure and how it presents the information like it’s a required reading. Thankfully, it’s interspersed with some pretty pictures. DiCaprio is a great actor, and he creates a believable character out of Cobb even when the script doesn’t let him fully realize his character. The biggest problem with Inception is that it expects you to know all of the characters beforehand. It introduces his wife Molly (Marion Cotillard) as if we’d been watching this TV show for a few episodes. Page waltzes onto the screen nonchalantly with no back-story, and we’re expected to care. Like a dream, it drops you in the middle and you don’t know how you got there. The acting is all great despite that weakness. Along with DiCaprio, Cotillard and Joseph Gordon-Levitt deliver fine performances. Cotillard will freeze your blood as an imaginary version of a lost love trapped in her lover’s subconscious. Movie directors handle dreams in different ways. The warped mind of David Lynch has set the bar for surrealism in modern movies, but Nolan isn’t going for that type of experience. The dreams of this director feel like the rest of the movie, and are concocted as part of the plot rather than surrealistic by-products. It can be both a strength and a weakness. The physics-bending fight sequences are great, but the structuring of dreams-within-dreams-within dreams at the beginning becomes a gimmick and throws the viewer off in a bad way when they seem so real. Nolan is not Alan Ball, and it shows. Despite those faults, Inception is a thrilling, unique experience. When the movie reaches its second half and the team tries to implant an idea in someone’s mind by creating a three layered dream, it’s impossible to stop watching. The cutting between these three sequences is handled perfectly, and it finds a new kind of sci-fi by blending many good old ideas. For a summer entertainment, it goes above and beyond. The beginning may fade like an uninteresting dream, but the rest, even the sure-to-be-griped-about ending, will haunt and engross you. This entry was posted in Reviews and tagged Best Summer Movies, Christopher Nolan, Dream movies, Early Inception Reviews, Ellen Page, How Good is Inception, Inception, Inception Box Office, Inception Box Office Predictions, Inception like Memento, Joseph Gordon-Levitt, Leonardo DiCaprio, Marion Cotillard, Mind-bending movies, Summer Blockbusters, Summer movies, Visually striking by matterspamer. Bookmark the permalink. Wow, a B, huh? I won’t read any reviews until I see it for myself, but I see that it’s not as foolproof as people originally thought. That’s fine I guess, that help keeps my expectation in check. Funny how Nolan named the lead character of his last flick the same as his first one, Cobb, from Following. I just watched it last night and put the trailer up as my final countdown to the movie this week. Unfortunately I have yet to see it yet and see for myself how the hype plays for the film. Matt did a great write up I think. I will definitely let you know what I think when I get back from vacation and get to see this movie! Excellent review. This was entertaining and certainly a good movie when compared to the average summer blockbuster. However, despite all the convoluted tricks and flashy visuals, Inception felt emotionally bland and Nolan spends way too much time trying to explain every little detail of the “physics” of his universe instead of giving it a heart. Yeah I totally agree. It’s really showy, but the first part decides to explain everything without establishing any connections, which I guess if the Matrix was an influence is a similarity. Sorry to disagree Castor, but I actually felt the emotional side of the movie as well as all the physics stuff. It’s not a conventional love story per se, but it’s there and I was quite moved by it. I do agree that it’s much more than your average blockbuster. She’s an awesome actress. I was glad she got to be a villain in this. I can see where you’re coming from, but I was a bit more positive. Though I was engaged the whole way through, it’ll be interesting to see what the opening is like on a rewatch. I appreciate that you all treat it with respect, whereas most who don’t fall in love with “Inception” treat it like they gave it an F.
I am in the minority with that movie. I was completely uninterested in the plot, the characters and all that. The visuals was something to behold, but not much else.